Image taken by the Left Navigation camera onboard NASA's Mars rover Curiosity on Sol 2313 (2019-02-07 15:05:46 UTC) during the observation of the target "Alba." Curiosity is driving across the clay-bearing unit, which is still a very new terrain with many details yet to be understood. The region is covered in little pebbles - and has lots of small sand patches, too, both of which we continue to investigate. The Navigation camera image above shows the APXS being deployed on the sand patch Alba that was investigated on sol 2313. 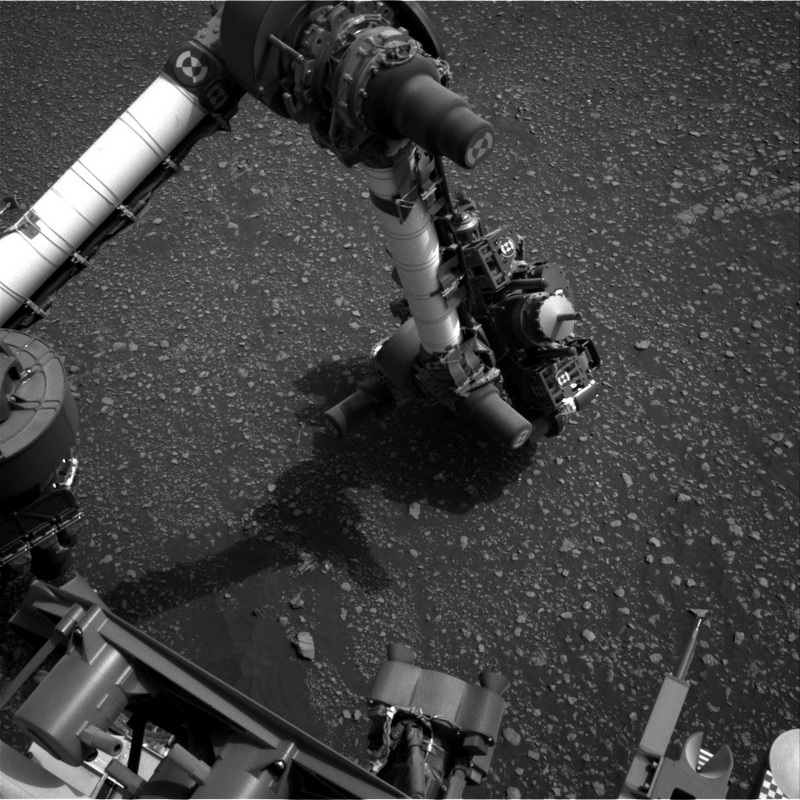 After that, the drive took us a little further north, to be exact, Curiosity drove 39 metres from the last location. The parking location presented us with the same pebbly-strewn surface as before, with the occasional small sand feature. With this terrain being new, and some small-scale sedimentary features spotted by the eagle-eyed sedimentologists on the team, we decided to use ChemCam on three pebbly targets, "Dauntless," "Otter," and Thistle." The team also found - for the first time in this new unit - a pebble large enough to get a full APXS raster on one continuous piece of rock. Yes, this is how small the pebbles are! We used the opportunity, named the target "Emerald," and investigated it using a 3-spot APXS raster, accompanied by MAHLI observations on this target. To put all the small pieces into context, we planned a large Mastcam multispectral raster investigation covering the workspace in front of the rover, and including the targets "Dauntless," "Faoilean" (a sand patch), and the APXS target "Emerald." It also covers some of the sedimentary details that were spotted in the post drive imaging. Two further Mastcam observations target aeolian features (target "River Brora") and a small ridge ahead of the rover, named "Osprey." ENV included atmospheric opacity measurements with both Mastcam and Navcam, as well as cloud observation movies and a dust-devil survey in our weekly morning suite. Now that the regional dust event has declined, we are seeing an uptick in dust devils! The drive is targeted towards a small outcrop - the largest piece of continuous rock so far seen in the new terrain. Go, Curiosity, geo-minded Earthlings will love to get close and personal to an outcrop soon again!